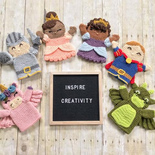 Now you can add a prince or knight to your fairy tale puppet collection! Puppets are great for creative play and story time. These could also be made in cotton yarns for a bath puppet! This pattern is a 2 in 1, coming with instructions for making a prince OR a knight. Get creative, and make a whole set for tea time, or a puppet show! Text and images copyright ©2019 by Erin Greene of ​ekayg​, all rights reserved. No pattern may be reproduced or distributed in any form by any method without written permission. Finished products made from this pattern may be used for sale. Please credit back to ​ekayg​. Please direct any questions about the pattern to my e­mail, ​ ekaygcrafts@gmail.com​ . I will respond as quickly as I am able.